When the Lake George Steamboat Company cruised into the 20th century, their fleet saw some major changes. Between 1901-1911, three of their steamboats would no longer service the company for various reasons, and in their stead, three new vessels would launch on Lake George. Steamboat travel remained popular on the lake through WWI and the Roaring Twenties, but the company would face its first real struggles when the effects of the Great Depression reached the region in the 1930s. In the previous entry of this history series, we described how in 1901, the Ticonderoga (I) burned down in Lake George due to an accidental fire, leaving the company with the Horicon (I) and the Mohican (I). To replace it, they commissioned the construction of an exciting new vessel in Lake George Village - the Sagamore. As the first steel hulled ship to operate on the waters of Lake George, the Sagamore was originally 203 feet long, 57.5 feet wide, and weighed 1,125 tons. Featuring a walking beam steam engine that provided 850 horsepower, the boat could reach speeds of 20mph. 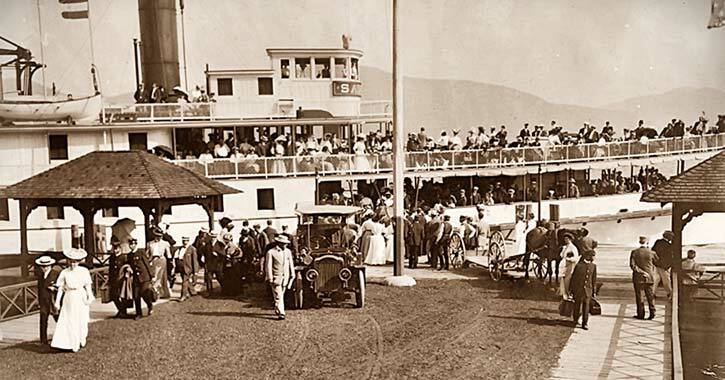 The Sagamore launched on Lake George in April 1902 in front of one of the largest crowds the village had ever seen. People came by train, bicycle, and even trolley cars to see the steamboat set off from the pier. The steamer was presented as the company's finest vessel at the time, able to carry 1,500 passengers, but experts soon determined the boat was too heavy and wide. To keep it in operation, the vessel had to be cut into two pieces and extended by 20 feet, bringing it to 223 feet in length. Years later in 1927, the Sagamore got lost in the fog and crashed into Anthony's Nose, a mountain on northern Lake George. After blocking the breach with a mattress, the captain was able to steer the boat to the Glenburnie dock where the passengers disembarked and the vessel sunk into 18 feet of water. The Lake George Steamboat Company was able to raise the sunken steamer and transport it to their Baldwin dock. In order to bring the boat onto the dry dock for repairs though, the company had to build a new $35,000 marine railway. The Sagamore was fully repaired in 1928 and re-launched on Lake George, but the start of the Great Depression would eventually force the company to retire the boat in 1932. During its lifespan, the Sagamore (1902-1932) actually operated alongside two different steamboats named Horicon. The Horicon (I) serviced the Lake George Steamboat Company until 1911, and then the aging vessel was replaced by its successor the Horicon (II). Compared to the Horicon (I), as well as all of the company's past and present vessels, the Horicon (II) was bigger, better, faster, and stronger. The steamer was and remains the longest and fastest passenger-carrying vessel to sail on Lake George. It was 230 feet long, 59 feet wide, had a 1,280 horsepower engine, and could reach a max speed of 21mph. Looking back, the steamer's first few decades of service were very successful, and it was a key part of the Lake George Steamboat Company's fleet. Unfortunately, from the 1920s-1930s, the ship became a victim of circumstance. In the late 1920s, a highway over Tongue Mountain completed the road connection between Lake George and Ticonderoga, which took traffic away from the steamboat company. In response, the Horicon (II) was turned into a "Show Boat," featuring music and dance cruises to entice new passengers. While these types of entertainment cruises were effective, the Great Depression would soon reach the shores of Lake George and force the steamboat company to cut costs and the number of trips. As steamboat travel decreased, the Horicon (II) faced the same fate as the Sagamore and would be retired and sold by 1939. Undoubtedly, the Great Depression played a major role in the changes that took place at the Lake George Steamboat Company in the early 20th century. Two of their best steamers, the Sagamore and the Horicon (II), had to be retired, and in the 1930s, the future of the company was in doubt. Despite these setbacks, the company remained in operation and would persevere through these hardships thanks to the Mohican (II). Christened in the summer of 1908, the steamer was built to replace and improve upon its predecessor. The new vessel was constructed with a steel hull and two propellers powered by steam engines. The Mohican (II) operated alongside the Sagamore and the Horicon (II) in the early 20th century. 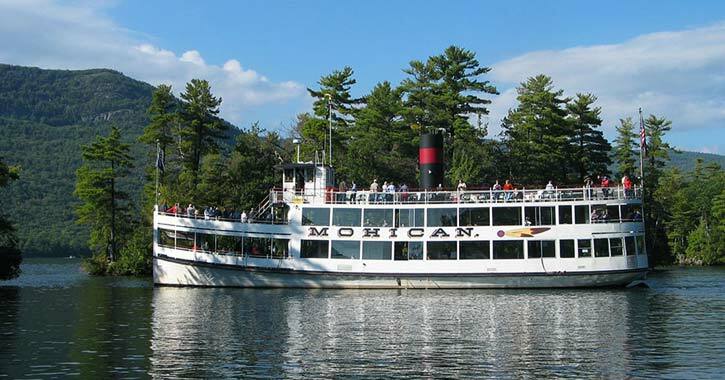 However, while those steamboats were retired as a result of the Great Depression, the Mohican (II) continued to sail and would be the only passenger-carrying vessel on the lake during World War II. Upon the conclusion of the war, the steamboat company saw a change in fortune. Wilbur Dow purchased the company in 1945 and was determined to upgrade the Mohican (II) and add more modern features. From the 1950s-1960s, smaller diesel engines were installed in the steamboat to open up space on the second deck and accommodate more passengers, and the ship's wooden structure was replaced by steel. These changes have helped the Mohican (II) stay in operation throughout the company's history and into 2017. In the latter half of the 20th century, three additional vessels would be added to the Lake George Steamboat Company's fleet. Stay tuned for the conclusion of this history series to learn about their role in shaping the company's history.